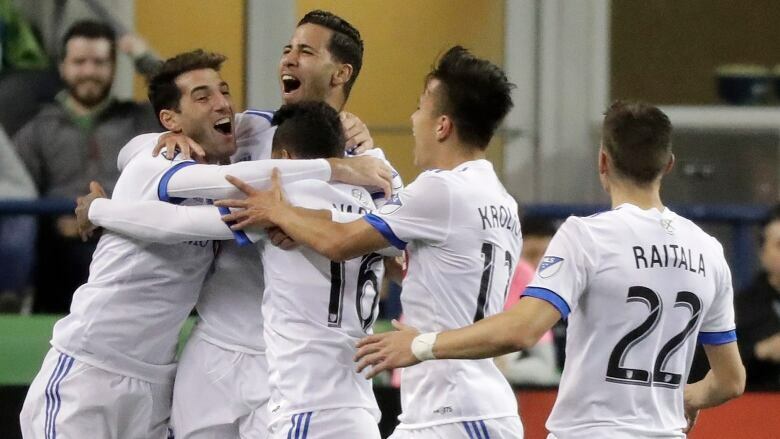 Jeisson Vargas scored on a point-blank shot in the 60th minute, and the Montreal Impact beat the short-handed Seattle Sounders 1-0 Saturday night. Jeisson Vargas doesn't like to talk much. His scoring — and his Montreal Impact teammates — say plenty about him. "A lot of times, guys with that [quiet] type of personality aren't great on the field, but he has been fantastic for us," goalkeeper Evan Bush said of Chilean native Vargas, who is in his first MLS season. "I came in here and said congratulations to him, and he was laughing and smiling, just like a kid. "His personality and enthusiasm and playful attitude he has to play the game, it's infectious, and you can sense that." "I'm quite pleased with the results, and I'm quite pleased with the way we played the game," coach Remi Garde said. "We went under pressure in the second half, even though we were a man up. We knew Seattle was a good team, especially in home games. We have these two games in a row, so we're going to try to keep this momentum." "While we had some good moments — we had a couple of sequences where we were able to keep possession in their field, win the ball back, stuff like that — it's not as good as we would have liked," Sounders coach Brian Schmetzer said. "I thought the chances we created with 10 men were pretty decent. Some of those set pieces we were dangerous on." Ignacio Piatti set up Vargas' goal. Piatti had the ball on the top right side of the 6-yard box. He tried to get closer to the net, but couldn't get psat Seattle defender Roman Torres. Piatti passed it back toward the top of the 6, and Vargas sent a wide-open shot into the back left corner, his second goal of the year. "That was a big goal, and I'm really happy for him," defender Ken Krolicki said. "He could have had the one in the first half. But one goal is all you need if you defend well." The Sounders have been down a man for 110 of the 270 minutes they've played this year. "I get it - guys get heated in the heat of the moment," Schmetzer said. "But that's when you have to be most composed. That sort of stuff is going to stop."